I'm not a politician, I'm a Freirean activist whose entire life revolves around the struggle. Therefore, the active struggles for social justice in our communities are one in the same as my campaign. I don't see them as separate, and my campaign takes second place to the struggles on the ground. As I said to a close fellow activist the other day, "It doesn't make sense for me to avoid struggles to save public education during my LAUSD run, because there might not be a district left by the time the Anschutz Four and Broad's Chosen One are through." While electing a board majority that values public education is crucial, it doesn't alleviate the need for the struggle in our communities. First published on Echo Park Patch on January 2, 2013. One of the more intriguing aspects of being a candidate for a high profile office like Member of Board of Education, Los Angeles Unified School District, is the number of questionnaires various organizations ask you to complete. Some of these are for endorsement considerations, others are just to publicize your stances on various issues. Today Arts for LA sent me a five question survey. When answering the questions, I realized it would be worth publishing the Q&A since, in my eyes, it addresses many of the fundamentally flawed issues with national standards and punitive testing regimes they engender. Arts for LA: What meaningful experiences with the arts (visual arts, dance, drama, and/or music) did you have growing up? Robert D. Skeels: Even though I grew up in relative poverty (food-stamps, welfare, etc), our New York schools required playing an instrument, participation in drama, and taking classes in visual arts. I was exposed to French horn, trombone, and guitar, and still play the latter to this day. One of the most memorable field trips I recall from childhood is when our class went Radio City Music Hall to see Madama Butterfly. We even had electives like music theory which relate to mathematics. Classes in fine art gave me enough skills that when I later became a graphic artist, my illustration abilities kept me in constant demand. All of those experiences were interconnected with literature, an appreciation for arts, and an understanding that there is much more to being human than test scores and salaries. Arts for LA: What role do you think the arts can play in supporting key priorities of the district, such as closing the achievement gap, reducing the dropout rate, and preparing more students for college eligibility and the twenty-first century workforce? Robert D. Skeels: The critical thinking skills and ability to cognate interconnectedness between disparate disciplines fostered by the arts are far more important than rote memorization for standardized tests. For the record, critical thinking skills are essential regardless of what century we are in. This is why the children of the wealthy are exposed so heavily to the arts, whereas working class children aren't. Finding things that interest and captivate students is the key to reducing the dropout rate, encouraging students to find passions that lead them to college, etc. If we were educating the whole child in addition to providing wrap around services, then the achievement gap would ameliorate. Arts for LA: A standards-based arts curriculum is one of the five core subjects in No Child Left Behind and critical for developing job skills vital in the creative economy and the twenty-first century workforce. Yet, most often, only "what is tested is taught" in our schools. How do you envision bringing balance back for a comprehensive education and ensuring all students have access to a quality, standards-based arts education curriculum? Robert D. Skeels: The obsession with standards and punitive testing brought on by NCLB and its descendants RTTT and CCSS, have perverted and warped curriculum. Bringing balance back means resisting standardized tests and curriculum, and insisting that our students are provided rounded, culturally relevant curricula. While we still need to push for more arts and a rounded curriculum within the current regime of standards, ultimately we need to fight for curriculum decisions being made on a local level that address the needs of students. A nationally standardized arts curriculum further marginalizes children of color and those from different cultures. We need arts that are part of ethnic studies courses in order to respect cultural heritages. Arts for LA: If elected, how will you engage classroom teachers, arts teachers, parents, and community arts organizations to implement your district's strategic arts plan? If you are not familiar with the plan, how can the district make the plan more visible? Robert D. Skeels: Again, the de-emphasis in the arts in our schools is a direct result of national policies that have created an abject high-stakes environment where test preparation takes precedent over teaching and learning. I would work with all the stake-holders (who are natural allies) mentioned in the question above to create widespread awareness and outreach as to the critical importance of a rounded curriculum that sees the arts, including literature, as the primary, not secondary goal of education. Such a campaign would necessitate revising the existing LAUSD arts plan, which still sees test-prep as being paramount. 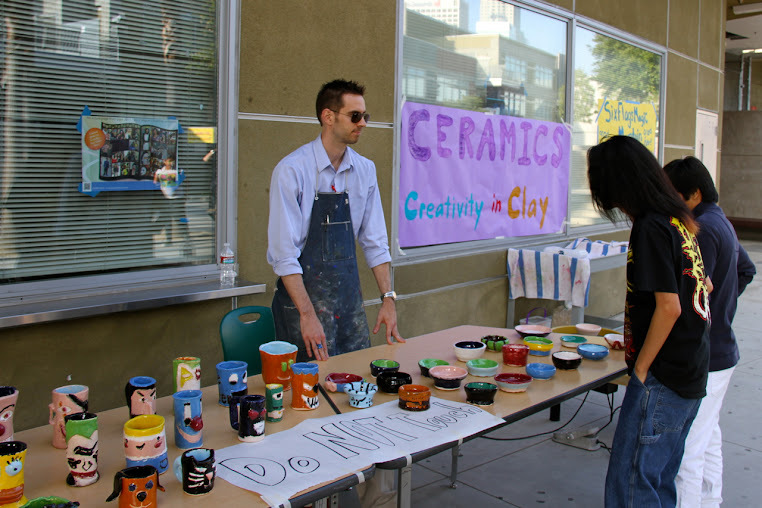 Arts for LA: Over 50% of School Districts in Los Angeles County have adopted Arts Education policies and plans to restore all arts disciplines into the core curriculum of K-12 classrooms. If elected, what would you do to develop and adopt a policy and implementation plan to increase access to the arts in the district? Robert D. Skeels: Efforts to restore arts via policies and plans are laudable. However, so long as our public schools are threatened with catastrophic consequences like closure, reconstitution, or being handed over to a privately managed charter corporations, there is little hope that they will actually be able to execute such policies and plans. National education policy has created conditions where deviation from what is required on standardized tests is impossible, despite platitudes from the Secretary of Education on the importance of the arts. Board Members on the second largest school district have a moral obligation to challenge the reasons why the arts, electives, vocational training, and anything outside the narrow confines of NCLB/RTTT/CCSS aren't considered important. 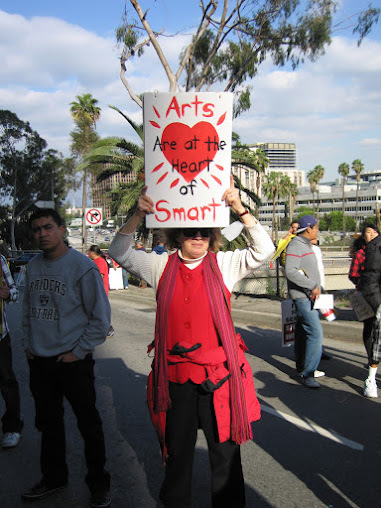 In practice, really expanding our arts curricula in LAUSD would be a visible sign of resistance to the testing-industrial-complex controlling U.S. education policy. A VIP helped us promote Sunday's 1010 Wilshire event! Many thanks to Dr. Diane Ravitch for helping us get the word out. If you are in Los Angeles, please plan on attending. Remember LAUSD Board Members' votes effect everyone in the city. For many years the people of Los Angeles City Council District 9 (CD9) have not been represented. Instead, deep pocketed developers have had virtually unfettered influence and access, and we've seen tragedies like the razing of the South Central Farm, the victimization of the homeless under Safer Cities Initiative, and intentional blight to displace low income families of color to make way for gentrification and development greed. Indeed the past dozen years have seen the residents of CD9 subjected to all manners of indignities, exploitations, and oppressions, including environmental racism. Community members and groups asked long time community activist Ron Gochez to run for the CD9 seat. While Ron has never had aspirations of running for political office, he has always been responsive to the needs of his community. He is backed by a diverse, multiracial, multi-ethnic coalition of working class peoples, many of whom are immigrants, who are tired of their voices being utterly ignored on City Council. I've known Ron for many years. He is a man of conviction, principle, and integrity. He has spent countless hours in selfless service to his community, and most importantly, to those who are the most vulnerable in our society. He is never afraid to speak truth to power, and he alone is the only candidate for CD9 that will represent the families and working peoples of such an underserved and exploited community. Ron is a social justice educator both professionally in his role as a teacher, and in his every interaction with his community. We need more people of conscious to take a stand like Ron has. His campaign is known as the "People’s Campaign," and that is truly what it is. That is why I have contributed to his campaign and wholeheartedly endorse Ron Gochez for Los Angeles City Council District 9. Hope Is an Open Book, an op-ed piece by author Walter Dean Myers, was tweeted this morning by educator Susan Ohanian. While written in 2005, Myers' message about access to books is profound and even more urgent today with canned corporate education solutions that narrow curriculum dominating policy. Sadly, Los Angeles Unified School District (LAUSD) is run by a Superintendent who neither values books, nor libraries. This has to change, and change quickly. We need to shutdown LAUSD's testing-industrial-complex and reopen both our school and classroom libraries. Reopening libraries also means rehiring credentialed librarian-educators. We can pay for that by ditching discredited and expensive attempts to tie teacher evaluations to test scores (VAM/AGT) and use the millions of squandered dollars associated with them. Read with your children, read in front of your children, and let them choose their own reading materials. It's a proven formula for fostering authentic life-long learning. Free Voluntary Reading (FVR) is a well researched methodology in which students are allowed to choose their own reading materials. Professor Stephen Krashen and his colleagues have found that "[r]ecreational reading or reading for pleasure is the major source of our reading competence, our vocabulary, and our ability to handle complex grammatical constructions." The Power of Reading, Second Edition: Insights from the Research is an excellent text to familiarize oneself with the concepts and research behind FVR. For far too long only the well-paid members of the Nonprofit Industrial Complex (NPIC) posing as parents have been able to attend public LAUSD board meetings. Why? Because the meetings are intentionally held when working people...well, are at work or attending school. This petition calls on LAUSD to move public meetings to the evening so that the true voice of the community will be heard. Parents, students, educators, and community have been shut out of LAUSD. Meanwhile the charter industry and the NPICs have dominated the dialog and continue to provide the "Anschutz Four" board members political cover. As a District 2 Trustee candidate for LAUSD, I endorse all efforts to make board meetings accessible to real stakeholders, and not just the NPICs and wealthy charter sector executives. Download these bilingual petitions and get them into our communities! Long time enemy of public education — Mayor Antonio Villaraigosa — has used his long arm to initiate a vindictive reprisal against Social Justice Educator Ron Gochez. Villaraigosa's henchman, ex-Green Dot Corporation flunky Marshall Tuck, surreptitiously announced that the privately managed organization Partnership for Los Angeles Schools (PLAS) would be eliminating the only Ethnic Studies program at the culturally diverse South Los Angeles Santee High School. This overt political hit job robs impoverished students of color of their chance to learn about their culture and history. These politically motivated attacks are both racist and ethnocentric. PLAS' Marshal Tuck, Doc Ervin, Angela Bass and Ricardo Ruiz have a long history of these attacks. Four years ago they banned the Dual Language Program and the Academic English Mastery Program at Ritter, two years ago they banned the teaching of core subjects in Spanish at Roosevelt as they had done for a generation. When the core subjects are taught in Spanish, they are counted as A-G. When they are taught through the ESL dept, they typically are not. Join the struggle to save Ron Gochez and the highly regarded Ethnic Studies courses at Santee. Tell Marshall Tuck to stop book banning and killing cultures. Don't let PLAS turn Los Angeles into Arizona! 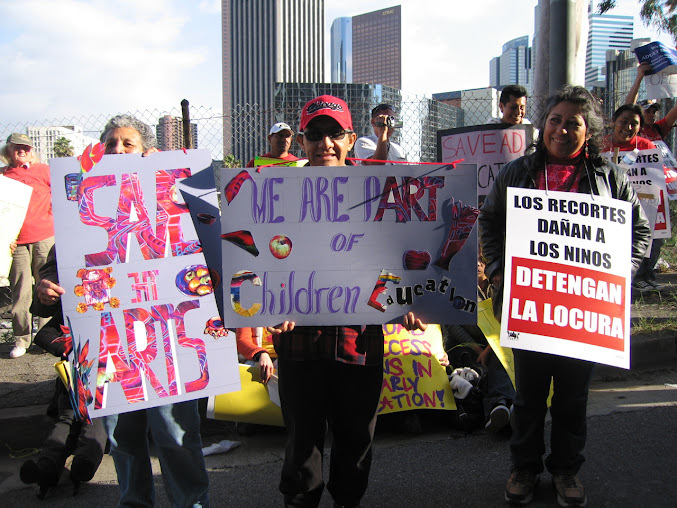 Save LAUSD Adult Education and other programs cut out of political expediency. Students, teachers and communities around the world have used pots and pans to call attention to attacks against basic human needs—and to call forth popular resistance. Schoolboard candidate Robert D. Skeels speaks at the Pico Union Town Hall to Save LAUSD Adult Education - Friday, May 25, 2012.